Nicolas Cage returns as Johnny Blaze in Warner Bros.' 3D supernatural action-thriller "Ghost Rider: Spirit of Vengeance." In the film, Johnny - still struggling with his curse as the devil's bounty hunter - is hiding out in a remote part of Eastern Europe when he is recruited by a secret sect of the church to save a young boy from the devil. At first, Johnny is reluctant to embrace the power of the Ghost Rider, but it is the only way to protect the boy - and possibly rid himself of his curse forever. 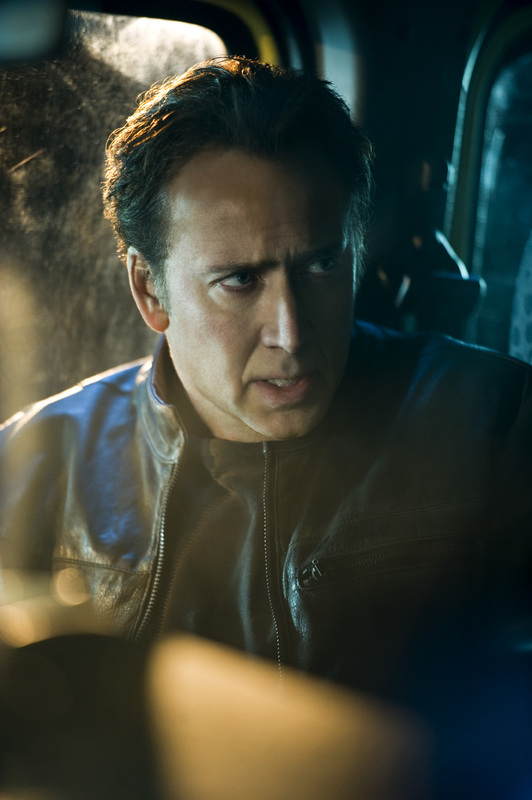 Check out the rest of Cage's thoughts about the film in the following interview. Q. What new things were you able to add to “Ghost Rider” this time? Nicolas Cage: When I was trying to think about how the Ghost Rider would move, I wanted to find something really weird, which would be like levitating in circles. We called it 'the compass' together, to mess with how he would attack his enemies. It was like trying to design a body language from another dimension that would hopefully scare you and entertain you. Q. Were there any stunts that really stood out for you, that really pushed your personal limits? Cage: All the wirework was very stimulating, but also very nauseating, literally. I was going around in circles, upside down, and I was really trying not to throw up because it kept spinning and spinning. It’s one of my favorite things that we all came up with together, so I’m glad it’s there. It was well worth it. Q. Did you have any pressure to make this film lighter? Cage: There’s a lot of humor to be found in sarcasm and darkness. You talk to any paramedic, they survive by developing a pretty off-kilter sense of humor. I think Blaze, with any luck, has that because he’s really dealing with the fact that his head goes on fire, for years now. In the first movie, he kept it at bay. He was more like an innocent goofball. In this movie, there’s been a little fiery tapdance on his head, for several years. I think it should change his personality quite a bit. Q. You played a character who had escaped from hell in “Drive Angry.” Are there any similarities or differences between that and this version of “Ghost Rider” ? Cage: They’re totally different. In “Drive Angry,” I was playing a living dead man. Blaze is a living man who turns into a demon, so it’s a totally different kind of energy. A living dead man has to be a little bit more dead, whereas a living man who turns into a ghost can still be very alive. Q. When you read comic books as a kid, it wasn’t always the coolest thing, but now you’re in a position in Hollywood to make those seemingly uncool things, cool for everybody. What’s it like to be in this moment in time, when all these characters you loved as a kid are being loved by the masses? Cage: I actually had a vision of it when I was 9, that this was going to happen. It took a while because we didn’t have the technology to make them come to life so magnificently, as we do today. It was always so goofy, the stupid costumes of “Spider-Man” in the old movies in the ‘60s and ‘70s, and “Captain America.” But now, it’s become all the rage because there’s something in it for everybody. It’s perfect entertainment. It’s exciting for me. I love seeing all the movies happen. Q. What comics do you read now? What are you passionate about? Cage: I was into Planet Hulk. I thought that was pretty inspired stuff. I went back in time and looked at Batman vs. Predator. I just had to see who won that battle. There’s a lot of fun stuff. It’s always a good experience to go shopping in a local comic book shop. Q. Who won that battle? Cage: It was kind of a tie-breaker, but they usually are. I think Batman won, which was a bit of a stretch. Brian Taylor: We’ve decided that Ghost Rider can kill all the other superheroes. Ghost Rider can beat Superman. Cage: Because he has the penance stare, and everyone’s done something wrong. He will just look at you over and over and over and over again.